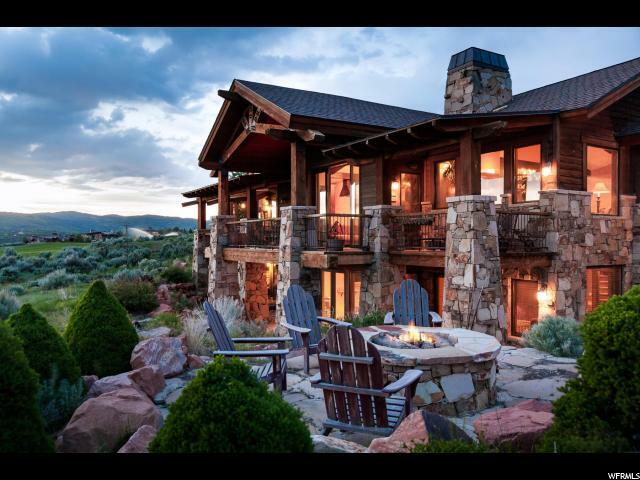 All PROMONTORY homes currently listed for sale in Park City as of 04/19/2019 are shown below. You can change the search criteria at any time by pressing the 'Change Search' button below. "Embracing the finest level of quality and detailed finishes, this extraordinary residence will delight the moment you enter the driveway. Designed to deliver the most indulging lifestyle with rock solid construction, comfortable livings spaces and fabulous ski resort views all wrapped into an attractive mountain contemporary design. 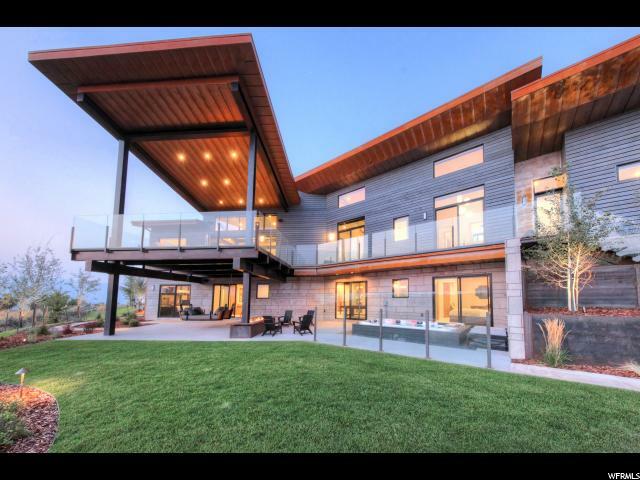 From the artistic waterscape upon entering to the expansive view deck encompassing Park City's famed ski resorts, this home will simply sweep you off your feet. Every aspect of this exquisite home has been finely crafted from the floating, stepped and trough ceilings, Italian Venetian plastered walls to the warm earthy stone finishes. Perfection on every level! " 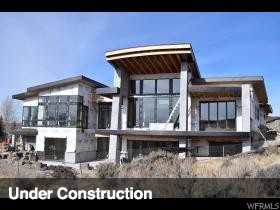 "Beautiful mountain contemporary home designed to maximize the unobstructed panoramic views offered by this property. Highest quality construction. Customize this home to suit your taste. Building the home with alternate modern elevations is an option. Contact listing agent for details. To be built on spectacular view lot in The Palisades neighborhood in Promontory and backs open space with unobstructed views in both directions. " 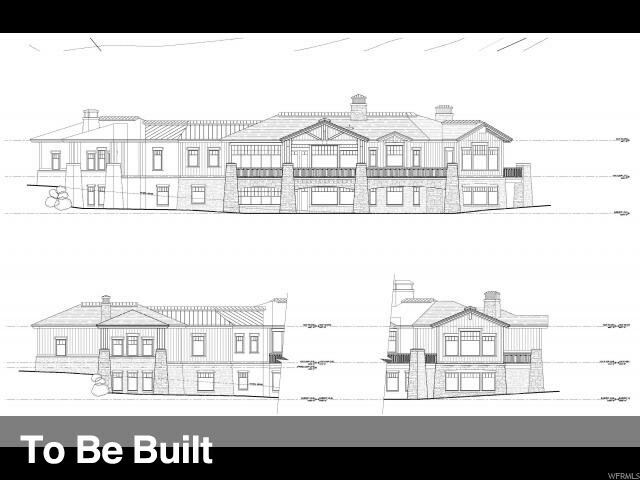 "Stunning new construction on a lower Promontory Sunset ridge lot. Main level master suite with views of the resorts. Also has additional 4 guest suites. Upper level loft is perfect for your home office, and the finished basement has ample space for ski and exercise equipment. Enjoy open entertaining from the great room to the patio with meadow and mountain views, made cozy with an outdoor fireplace. Kitchen has two islands! 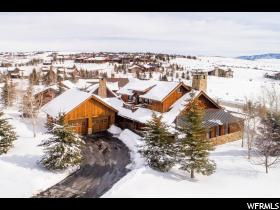 In addition to the amenities available at Promontory this home is only a moments drive to the 26 mile trail system from Park City to Echo lake perfect for cross country skiing, biking, and jogging. Golf and club memberships available to purchase separately Square footage figures are provided as a courtesy estimate only and were obtained from builder plans . Buyer is advised to obtain an independent measurement and responsible for 1% transfer fee. " "This new, modern home with remarkable ski views is located in our Palisades neighborhood with easy access to and from the Equestrian Gate. This well-designed home is equipped with beautiful upgrades and an open floor plan with two master suites on the main floor. Enjoy outdoor living while opening the pocket sliding glass doors to an expansive deck, which showcases the vast mountain views. This home is sure to please with a fire pit, downstairs wet bar, movie theater, popcorn station, and more. Come live in a perfect four-season mountain club for all ages, offering a wide array of activities for the whole family. Furnishings negotiable and a fully sponsored Golf Membership is included in the purchase through a separate bill of sale ($150K value). *** Hurry ***-The Fully Sponsored Membership is set to expire on 5/23/19 and is a one-time ownership and is non-transferable." "This fully furnished mountain contemporary home is within walking distance to Promontory's main amenities and is situated in a private cul-de-sac which backs to the 7th fairway of the Pete Dye Golf Course. Enjoy spectacular sunsets and unobstructed views of Park City's ski resorts and Wasatch mountain range from your expansive covered deck. This home features an open and spacious floor plan, beautiful hand-scraped walnut floors, fresh paint and exterior stain, theater room, game room, walk-out basement, wine cellar, full lower level kitchen, and additional parking with a stunning porte-coch re entrance to greet you. Buyer to pay 1% Community Enhancement Fee. Full Membership negotiable through a separate bill of sale." "Situated in the Sunset Ridge Sub-division this impeccably designed home comes with beautiful views, privacy and outdoor living with it multiple decks & patios. Filled with upgrades this home comes with Wolf & Sub-zero appliances in the gourmet kitchen. The master quarters includes a steam shower, private deck & a large closet. 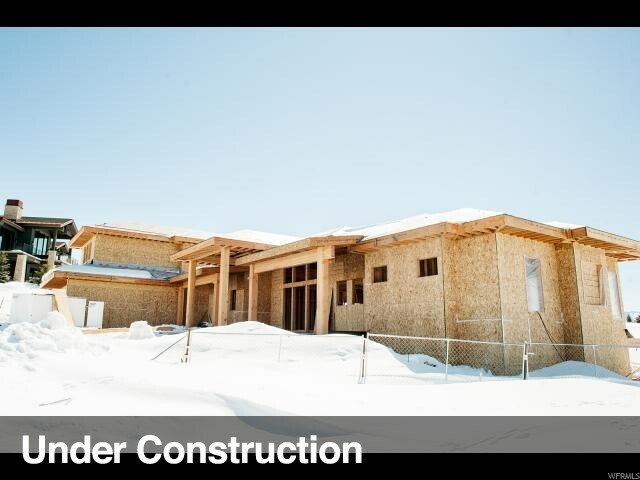 The lower level bar, an over the top theater w/ a golf simulator & control 4 system, a fire pit, pool table, hot tub and radiant heat are just a few of the custom features this home has to offer. Just a short drive to many of the club amenities including the beach club, pool, spa, gym, tennis, multiple club houses, ice skating, kids cabin and the Shed, which includes indoor basketball, bowling, and theater." "Live family life to the fullest in this updated mountain home. Watch the sunset in your great room, warmed by the floor to ceiling fireplace. Bake cookies or a fresh meal in the well equipped kitchen. Every corner of the home has sophisticated quality finishes, like reclaimed wood walls, majestic ceiling beams, a floating staircase, rich wood flooring, built in bookcases, modern light fixtures and custom lockers and cabinetry. The main level master has his and hers closets and all of the bedrooms have attached bathrooms. Enjoy a brisk hike or leisurely stroll on the 30 miles of trails starting just steps from your door. This home has convenient access to Promontory's main gate putting you just 30 minutes from Salt Lake Int'l Airport without a stoplight. " "Forget about city life while you're here! This furnished cabin is in Promontory, Park City's favorite private community, with golf, skiing, dining and adventure for the whole family just out the front door. After a long day of skiing or golf, relax in front of the floor to ceiling fireplace while watching the sunset. The well appointed eat in kitchen will delight the chef in your family, while the nearby sports bar, chop house or coffee bar will delight restaurant lovers. Located just steps from a grassy park, and adjacent to 30 miles of trails, you will enjoy every moment here. Professionally furnished by Alder and Tweed. " "One owner Bridger model Trapper Cabin in amazing condition that has never been rented. Perfectly located within walking distance to the Shed and other club amenities on a private cul-de-sac. Enjoy the eastern views as the sun rises over the Pete Dye golf course while the deer gather in your back yard from your covered patio deck. This cabin offers a spacious open main living floor plan with a coveted wood burning fire place, which flows into a functional chef's kitchen with professional Viking appliances. Large master bedroom on the main level with dual master closets, plus extra built in closet space, and air tub for relaxing. Main level powder bath, wine cooler, pantry storage, and extensive storage cabinetry in garage with ski storage and boot drying system. Two bedrooms upstairs plus a large media room that could also be used as an office or bunk room. This beautiful cabin has it all! Enjoy the Promontory Clubhouse compound, including the new Tubing Hill and Beach House through a private Club Membership available by separate transaction with the Promontory Club. This property is eligible for nightly rentals. HOA dues take care of snow removal and landscaping maintenance. A bonus 3 months free Club dues to buyer as well. "